Barack Obama’s logic for bombing Syria: The United States will seek to put an end to Bashar Assad’s use of chemical weapons. President Obama will likely bomb Bashar Assad’s regime in Syria. Here is the logic—and limits—for the president’s plan of attack. 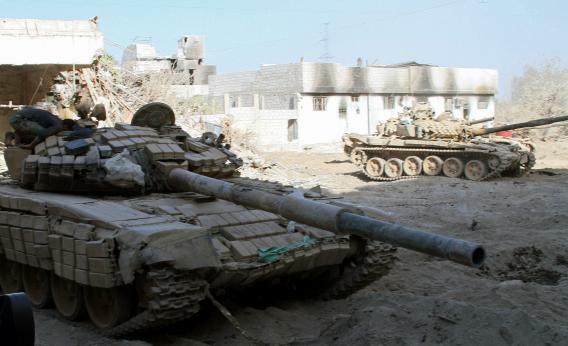 Syrian army tanks in Damascus on Saturday. Obama may be considering a strike against Assad’s regime. It seems likely that President Obama will bomb Syria sometime in the coming weeks. His top civilian and military advisers are meeting in the White House on Saturday to discuss options. American warships are heading toward the area; those already there, at least one of which had been scheduled for a port call, are standing by. Most telling perhaps is a story in the New York Times, noting that Obama’s national-security aides are studying the 1999 air war in Kosovo as a possible blueprint for action in Syria. In that conflict 14 years ago, ethnic Albanians in Kosovo, an autonomous province of Serbia, were being massacred by Serbian president Slobodan Milosevic. President Bill Clinton, after much reluctance, decided to intervene, but couldn’t get authorization from the U.N. Security Council, where Russia—Serbia’s main ally—was certain to veto any resolution on the use of force. So Clinton turned to NATO, an appropriate instrument to deal with a crisis in the middle of Europe. The parallels with Syria are obvious. In this case too, an American president, after much reluctance, seems to be considering the use of force but can’t get authorization from the U.N. because of Russia’s (and China’s) certain veto. The pressures to act have swelled in recent days, with the growing evidence—gleaned not just from Syrian rebels but also from independent physicians’ groups and U.S. intelligence—that Assad’s forces have used chemical weapons, killing more than 1,000 civilians. But where can Obama turn for the legitimacy of a multinational alliance? Nobody has yet said, but a possible answer is, once again, NATO—this time led perhaps by Turkey, the alliance’s easternmost member, whose leaders are very concerned by the growing death toll and instability in Syria just across their southern border. The weapons that NATO used—and, more important, did not use—in Kosovo are also likely to appeal to President Obama. Clinton was insistent that no U.S. ground troops be sent to aid the Albanians and told his commanders to keep from losing a single American in the fight, if possible. And so, the Kosovo campaign was, from America’s vantage, strictly an air war. (Just two U.S. servicemen were killed, and not in battle but in an Apache helicopter that crashed during an exercise.) The air war went on for what seemed, at the time, an eternity—78 days. More than 1,000 NATO planes (including the first Predator drones) flew a total of 38,000 combat sorties. The bombs—most of them dropped from altitudes of 10,000 feet and higher, to avoid air-defense batteries—seemed to have no effect on Milosevic’s actions until the final days of the campaign, and so NATO’s commanders kept adjusting and expanding the target list, which ranged from military bases, factories, and electrical power plants to individual Serbian tanks on the battlefield. In the end, though, the war was won. The strategic goals were to stop the fighting, force Milosevic to pull back his army, restore Kosovo as an autonomous Albanian enclave, and insert NATO troops—30,000 of them—as peacekeepers. All the goals were met. During and after the war, many Republicans and some retired U.S. military officers lambasted Clinton for relying so heavily on NATO. They called it a war “by committee” and claimed that it could have been won much more quickly had America gone it alone. But Gen. Wesley Clark, who was NATO chief at the time, later argued in his book, Waging Modern War: Bosnia, Kosovo and the Future of Combat, that the multilateral approach was necessary for two reasons: to give the war legitimacy (especially given the lack of a U.N. resolution) and to counter whatever resistance the Russians might muster (in the end, Milosevic surrendered when he realized that, despite earlier promises, Moscow was not coming to his rescue). Let’s say that Obama agrees that NATO could be the key force of an air campaign in Syria—and that enough NATO members agree to go along. (In Kosovo, every member of the alliance, except Greece, played some kind of role.) What would be the war’s objectives? This is the crucial question of any military intervention. It should be asked, and answered, before a decision is made to intervene—along with a calculation of how much effort might be needed to accomplish those objectives and whether the cost is worth the benefit. A few things are clear from Obama’s record as commander-in-chief: He tends to resist the use of military force. When he sees it as unavoidable, he tends to steer clear of grandiose objectives, and he demands that allied nations come along, even take the lead, especially if their interests in the conflict outweigh ours. If Obama does use force in Syria, he will do so because of clear evidence that Assad’s regime has killed lots of civilians with chemical weapons. Two considerations will likely drive his decision, if it comes to that. First, he has drawn a “red line” on this issue, publicly, at least five times in the last year, and failure to follow through—especially after the latest revelations—would send confusing signals, at best, about U.S. resolve and credibility. Second, failure to respond would erode, perhaps obliterate, the taboo that the international community has placed on chemical weapons (especially nerve gas) since the end of World War I. I suspect that this factor may be more pertinent to Obama, who takes the issue of international norms very seriously. So the No. 1 objective of a U.S. air campaign against Syria would be the seemingly limited one of deterring or preventing Assad’s regime from using chemical weapons again. However, Obama’s top generals and intelligence officers would likely tell him that they can’t do much to fulfill this mission. They probably don’t know where the remaining chemical stockpile is located, so they wouldn’t be able to destroy it. And the notion of using military force to deter some future action is a bit vague: It’s unclear whether it would have any effect on Assad. Obama would also have to specify the additional damage he’d inflict if Assad ignored the message, and he’d have to be reasonably sure ahead of time that that damage would be enough to deter him from taking the dare. A more extravagant, but possibly more feasible, target of an air strike might be Assad’s regime itself—with the objective of destroying it or at least severely weakening it. In an Aug. 5 letter to Congress, made public just this past week, Gen. Martin Dempsey, chairman of the Joint Chiefs of Staff, made a comment pertinent to this point. He said that if Assad’s regime were to topple, none of the myriad Syrian rebel factions are currently in a position to fill the power vacuum. Nor, if any of these factions did come to power, do they seem inclined to promote U.S. interests. For that reason, he expressed skepticism about the good of taking the side of a particular rebel faction or, presumably, sending its fighters more arms. However, Dempsey also said in this letter that U.S. military intervention could tip the balance against Assad in the Syrian civil war—by, among other things, destroying his military assets and infrastructure as well as reducing the flow of arms from Iran, Russia, and others. This marked the first time that Obama has mentioned “core national interests” in the context of Syria. It may signal rising pressures to do something—and, again, Kosovo, where Clinton switched his views on intervention dramatically, serves as an intriguing parallel. That would be the risk, and it’s the sort of risk that Obama is generally inclined to avoid. There have been some exceptions, most notably in Libya, where he concluded that the important thing was to get rid of Qaddafi and to let those on the ground—aided to some extent by the United States but more by allies with bigger stakes in the region—settle the aftermath. This may be the position he takes in Syria, in consultation with Turkey, Saudi Arabia, Jordan, and other interested parties, which would play some role along with the NATO command. If he decides to use force, it’s the only position he could reasonably take. Given the threat, the humanitarian crisis, America’s standing in the region, and the importance of preserving international norms against the use of weapons of mass destruction, the best option might be to destroy huge chunks of the Syrian military, throw Assad’s regime off balance, and let those on the ground settle the aftermath. Maybe this would finally compel Assad to negotiate seriously; maybe it would compel the Russians to backpedal on their support (as NATO’s campaign in Kosovo compelled them to soften their support for Milosevic). Or maybe it would just sire chaos and violence. But there’s plenty of both now, and there might be less—a road to some sort of settlement might be easier to plow—if Assad were severely weakened or no longer around.